Chicago Police: 5 Officers Died By Suicide Since July Some officials and mental health experts say the suicides are a sign of deeper problems with the mental health and well-being of Chicago police officers. 5 Chicago Police Officers Died By Suicide Since July. Is The Department Doing Enough? 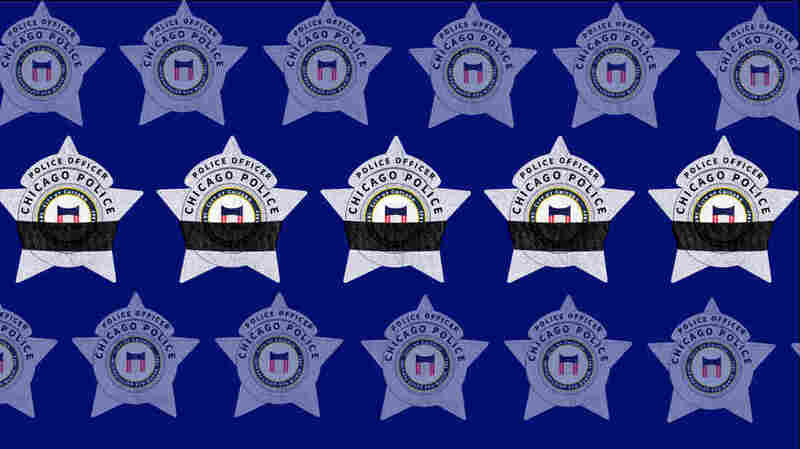 When a fellow officer dies, Chicago police wear black bands around their badges as a sign of mourning. At least five Chicago officers have taken their own lives since July. In September 2017, Chicago Police Officer Regine Perpignan was hospitalized for depression, relatives said. Perpignan was a 26-year veteran of the department. She was 54, with two daughters and a granddaughter. Her brother and sister-in-law said Perpignan got counseling through the department and was taken off the street while she was getting help. Perpignan's sister-in-law Rochelle Perpignan said Regine went back to policing near the end of 2017. Police spokesman Anthony Guglielmi would not confirm the timeline. "They put her back on duty too fast," her brother, Roland Perpignan, said. "Someone who's been having mental issues and you know is not well should not be going back to duty ... and given a gun." In September 2018, in the parking lot of the Calumet District police station on the far South Side, before she was scheduled to begin her workday, Perpignan killed herself, according to the Cook County Medical Examiner's office. She used her service revolver. "To think how much she must have been suffering to get to that point," Roland Perpignan said. "You know you gotta be suffering a lot and be in a lot of pain to [think that's the only way out]." Perpignan was one of at least five Chicago police officers to kill themselves since July. What's more, she was one of three officers to do so while on duty or on police property, an exceedingly rare occurrence, according to experts. The police department is unable to provide historic numbers on officer suicides, said Guglielmi, the police spokesman. But the U.S. Department of Justice found that between 2013 and 2015, CPD had a suicide rate up to 60 percent higher than the national average for law enforcement officers. Those numbers are spurring action by officers, police officials and mental health experts. They said the suicides are a sign of deeper problems with the mental health and well-being of Chicago police officers. The U.S. Department of Justice and other experts say addressing those issues is also essential to the success of mandated police reform in the city and to a better relationship between police and community members. Police department leaders said they're taking big steps to address the issue, but former officers and some mental health professionals are asking whether the city is doing enough, and whether it's focused on the right problems. "The only way to listen ... is to actually go out there"
Last year, Chicago Police Sgt. Shawn Kennedy was tapped to join a working group that focused on officer wellness. Kennedy was part of a group that went to each police district to encourage officers to seek help if they were struggling emotionally. "That was the first time that we proactively went out and talked to every district and unit on every watch," Kennedy said. "The only way to listen to officers is to actually go out there where they work at and talk with them, and that's what we've been doing." Kennedy said his hope at the outset was to have no officer suicides that year. Instead, by the end of 2018, five Chicago police officers had killed themselves. And what really stood out to him was that three of the officers took their own lives while on duty or on police property. "Most departments, including Chicago, each year, you do have whatever number of officers who will commit suicide, but normally that happens off duty," Kennedy said. "In my almost 29 years, I cannot remember the last time we had an officer commit suicide on duty." Kennedy became the ranking officer in the department's Employee Assistance Program in October 2018. He said he has noticed a big change in the number of officers seeking help, and he isn't sure it's fair to blame the job of policing for the high number of officer suicides. "I don't feel it's a sign. ... Officers are just people like anyone else. It's going to happen," Kennedy said. "There are so many different variables that happen in a personal life that can add to that situation of feeling overwhelmed." Clinical psychologist Carrie Steiner said officer suicides are "absolutely" a sign of deeper problems within the department — especially the three on-duty suicides. "To me, those officers that committed suicide on duty, in uniform, at work, is showing me that 'this job killed me,' " Steiner said. "And I think we as a culture, the police culture, need to hear them, so their lives are not taken in vain." Steiner was a Chicago police officer for 13 years. She got her doctorate in psychology while with the department, then left the force in 2010 to start the First Responders Wellness Center, a therapist office in southwest suburban Lombard, Ill.
"I recognized that so many officers were not doing well. I knew 18 officers that had killed themselves," Steiner said. "A lot of people started coming to me and asking me for help, and I realized that the need was more for me to help other officers rather than for me to be a police officer." Steiner has three other clinicians at her practice. She said they serve about 125 clients, and she estimates 70 percent of them are current Chicago police officers. Steiner said over the past couple of years, a lot of her police clients "are struggling." She said increased public outcry and scrutiny on police have taken a toll. On top of that, officers in Chicago are dealing with a unique level of trauma compared with most of the country. Over the past five years, officers in Chicago have responded to almost 3,000 murders. Steiner said that adds up to something called cumulative trauma. "When you're seeing all of that trauma, you start to change your total core belief system," Steiner said. "And so you're going to have more pessimistic officers, more officers that just don't believe that what they do has a purpose." The department has pledged to hire six more clinical therapists to serve Chicago police officers — bringing the total number of clinicians in the department to 10. Even with that hiring, Chicago's ratio of therapists to officers will still be worse than departments like Los Angeles and Miami. Maybe even more important than adding staff is ensuring the officers who need help feel comfortable asking for it. "The department will tell you, 'oh yeah we have these resources,' but they don't put anything in place to make it accessible," said former Chicago Police Officer Brian Warner. "They put a lot of these things in place, I think, just to appease the media and maybe to appease themselves, but they still have not taken the stigma away from the officer and more importantly they haven't taken the onus away from the officer [to seek out help]. I think it's the responsibility of the department to provide these things, and to make it so accessible that the officers feel comfortable doing it." Warner is an outspoken advocate for police mental health, and he said the recent officer suicides are proof the department isn't really making a dent in the problem. "If we've had five officers kill themselves in six months ... that's a failure," Warner said. "And for anybody to think otherwise is naive. For anybody to think, 'Oh it's not duty related' is naive, and almost callous, to say that person didn't kill themself because of the job they do each and everyday, and the inability for the department to provide an outlet to get rid of this trauma in a safe environment." Warner left the Chicago Police Department in 2011, after a shooting in which he was returned fire, killing the man who shot him. Warner said he still suffers from post-traumatic stress disorder from the shooting. Warner said that after the shooting, he took a year off to recover physically and mentally. He returned to the department with a plan from his doctor for how best to reacclimate to police work. He said the department rejected his plan and he was forced to leave the police force. "I felt abandoned. I felt abused by the department once again because when I first asked for resources they weren't able to provide them," Warner said. He said stories like his contribute to skepticism and confusion among officers about what support is available and about the potential consequences of seeking mental health care. And he said the department doesn't have enough training or policy in place to combat that. "There's an officer sitting in a squad car right now, dreading going out on the street, just beside him or herself, wondering, 'Where the hell do I turn?' " Warner said. "That uncertainty and that ambiguous way that it is handled currently is creating the environment where people are afraid to ask for help." One officer in the Calumet District who knew Regine Perpignan said she does not believe the department has improved how it's handling officer wellness. She spoke on the condition of anonymity because she is not authorized by the department to speak publicly. She said it still feels like it's everyone for themselves when it comes to getting help. "You'd better include mental health"
In the new reform plan, called a consent decree, the department is required to better let officers know about services and to "address stigmas, misinformation and other potential barriers to members using these services." It's clear that improving officer wellness is not just essential to officer safety, it's also crucial to the public safety of Chicago overall. The consent decree sets out lofty goals for improving the relationship between the community and police and for bringing down the number of violent encounters. It also states that officer wellness is critical to job performance and safety, both for the officer and the community. The least you can do is make sure people can get the help they need without any fear that they might lose their job. Brian Warner brings up a hypothetical scenario of an officer who has spent weeks seeing one trauma after another, without a healthy outlet or good coping skills. "And now he shows up with somebody who is in a mental health crisis, who is at a 10 ... the officer's probably at a 10, too," Warner said. "So if you're gonna pick and choose and go 'oh yeah we want de-escalation, and we want coppers to do this, and we want coppers to do that,' you'd better include mental health, you'd better include these resources." Steiner said the department should do annual wellness checks, where each officer meets with a clinical therapist. She said that would be an opportunity to decrease the stigma of seeing a mental health professional and would give the clinicians a chance to dispel misinformation. Rochelle Perpignan said her sister-in-law was afraid to get help for fear of repercussions at work. She doesn't blame the department for the death, but she does wish it had done a better job reaching out and reassuring her. "For someone who has done so much for the city, I just think the least you can do is make sure people can get the help they need without any fear that they might lose their job," Rochelle Perpignan said.